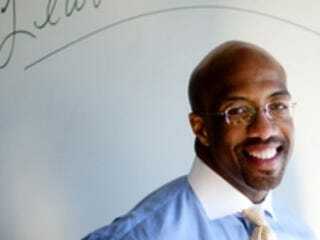 This weekend the New York Times profiled Michael Sorrell, a 2009 Root 100 honoree who is getting national attention for his work to turn around a struggling HBCU. He took over as president during one of the roughest patches in the 139-year history of Paul Quinn College, a private, religiously affiliated school in Texas. Through what the Times describes as "a combination of vision, bullheadedness, and the kind of charisma that begets donations and good will," he's saved the college from being shut down, removing abandoned buildings, putting admissions standard in place, getting rid of the football team, cleaning up the finances and hiring almost all new faculty and staff. Under his leadership, the school's six-year graduation rate has increased from 6 percent to 27, and he has committed to seeing it reach 90. He also wants to see the school's roughly 200 students reach 2,000 by 2020. In 2009 The Root called Sorrell Paul Quinn's best chance to survive — now it looks as though he might represent an opportunity for the institution to thrive.